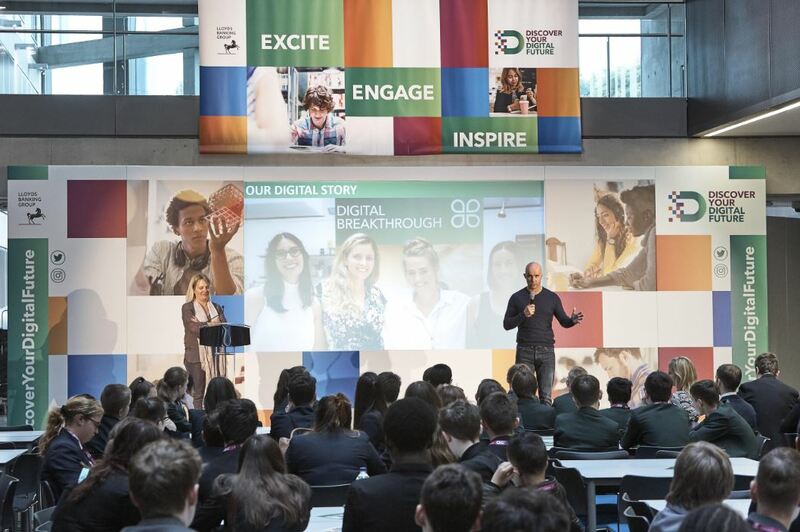 Digital leaders from Lloyds Banking Group, Microsoft, IBM, Facebook, BBC Make it Digital, TCS, Vodafone and Apadmi got together at Manchester Met Business School this week to give 350 school pupils from across Greater Manchester a chance to explore a career in digital. The event, led by Lloyds Banking Group’s Ambassador for the North and Managing Director, Digital, Nick Williams, also aimed to encourage more pupils, in particular girls, to choose science, technology, mathematics and engineering (STEM) subjects at A-Level as a stepping stone to a job in the region’s growing tech industry. Explaining the need for the event, Nick Williams said: “Nationally the industry is missing out on half of its potential workforce, with just sixteen percent of digital specialist roles held by women. Looking at our own region, of those students opting for an A-level in Computing, only around twenty percent are based in the North, compared to fifty percent in the South. Howard Simms, CEO and BBC iPlayer Radio app creator at Manchester’s Apadmi Ventures, spoke at the event. He said: “The UK needs an army of digitally capable people. With our burgeoning digital community in Manchester, there are already more jobs than there are skilled candidates. If we could encourage more young people into digital careers, we could continue to enhance our local tech scene and be in an even better position to attract some of the biggest names in global technology to the city. The event concluded with a session from Lloyds’ degree apprentice Joshua Bray and Dr Raheel Nawaz, one of his Digital & Technology Solutions lecturers at Manchester Met. They explained the different paths students could follow into technology, and specifically the fantastic opportunity of entering the industry as a degree apprentice.